Olympia by Édouard Manet, painted in 1863, it stirred an uproar when it was first exhibited at the 1865 Paris Salon. Today, it is considered as the start of modern art. 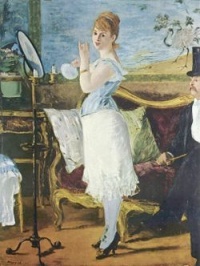 In 1877, French artist Édouard Manet exhibited "Nana", a life-size portrayal of a courtesan in undergarments, standing before her fully clothed gentleman caller. The model for it was the popular courtesan Henriette Hauser. A Bar at the Folies-Bergère, painted and exhibited at the Paris Salon in 1882, was the last major work by French painter Édouard Manet before he died. It depicts a scene in the Folies Bergère nightclub in Paris, depicting a bar-girl, one of the demimondaine, standing before a mirror. Édouard Manet (23 January 1832 – 30 April 1883) was a French painter. One of the first 19th-century artists to approach modern-life subjects, he was a pivotal figure in the development of Realism. His early masterworks, The Luncheon on the Grass (Le déjeuner sur l'herbe) and Olympia, engendered great controversy and served as rallying points for the young painters who would create Impressionism. Today, these are considered watershed paintings that mark the genesis of modern art. The roughly painted style and photographic lighting in these works was seen as specifically modern, and as a challenge to the Renaissance works Manet copied or used as source material. His work is considered 'early modern', partially because of the black outlining of figures, which draws attention to the surface of the picture plane and the material quality of paint. He became friends with the Impressionists Edgar Degas, Claude Monet, Pierre-Auguste Renoir, Alfred Sisley, Paul Cézanne, and Camille Pissarro, through another painter, Berthe Morisot, who was a member of the group and drew him into their activities. The grand niece of the painter Jean-Honoré Fragonard, Morisot's paintings first had been accepted in the Salon de Paris in 1864 and she continued to show in the salon for ten years. Manet became the friend and colleague of Berthe Morisot in 1868. She is credited with convincing Manet to attempt plein air painting, which she had been practicing since she had been introduced to it by another friend of hers, Camille Corot. 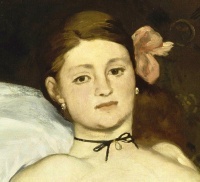 They had a reciprocating relationship and Manet incorporated some of her techniques into his paintings. In 1874, she became his sister-in-law when she married his brother, Eugene. Unlike the core Impressionist group, Manet maintained that modern artists should seek to exhibit at the Paris Salon rather than abandon it in favor of independent exhibitions. Nevertheless, when Manet was excluded from the International exhibition of 1867, he set up his own exhibition. His mother worried that he would waste all his inheritance on this project, which was enormously expensive. While the exhibition earned poor reviews from the major critics, it also provided his first contacts with several future Impressionist painters, including Degas. Although his own work influenced and anticipated the Impressionist style, he resisted involvement in Impressionist exhibitions, partly because he did not wish to be seen as the representative of a group identity, and partly because he preferred to exhibit at the Salon. Eva Gonzalès was his only formal student. He was influenced by the Impressionists, especially Monet and Morisot. Their influence is seen in Manet's use of lighter colors, but he retained his distinctive use of black, uncharacteristic of Impressionist painting. He painted many outdoor (plein air) pieces, but always returned to what he considered the serious work of the studio. Throughout his life, although resisted by art critics, Manet could number as his champions Émile Zola, who supported him publicly in the press, Stéphane Mallarmé, and Charles Baudelaire, who challenged him to depict life as it was. Manet, in turn, drew or painted each of them. Manet died of untreated syphilis and rheumatism, which he contracted in his forties. The disease caused him considerable pain and partial paralysis from locomotor ataxia in the years prior to his death. His left foot was amputated because of gangrene, an operation followed eleven days later by his death. He died at the age of fifty-one in Paris in 1883, and was buried in the Cimetière de Passy in the city. Unless indicated otherwise, the text in this article is either based on Wikipedia article "Édouard Manet" or another language Wikipedia page thereof used under the terms of the GNU Free Documentation License; or on original research by Jahsonic and friends. See Art and Popular Culture's copyright notice. This page was last modified 10:12, 25 March 2018. This page has been accessed 14,218 times.